Has speciation ever been observed in nature? Speciation is a hypothetical process by which new species arise. In fact, speciation has never been observed directly or indirectly. An atheist believes in speciation regardless of the evidence, because it serves as his substitute for the existence of God. Galapagos finches. Charles Darwin, who first studied the finch populations on the Galapagos Islands, believed that speciation required hundreds or even thousands of generations. Yet a remarkable instance of speciation has just been observed among these finches. In 1981 researchers observed a single male finch, normally residing on either Espanola or Gardner Island, on the Island Daphne Major. To their surprise, within a two generations a hybrid species had taken hold, exclusively breeding only with other finches descended from the original male [Cepelewicz2017]. Salamanders. Ensatina eschscholtzi is a lungless salamander that ranges from British Columbia in Canada, down the Pacific Coast and into the Baja Peninsula of Mexico. Within this population, seven "subspecies" have been recognized in a ring around the Central Valley of California. Near Mount Palomar, 50 miles northeast of San Diego, these two subspecies meet in a very narrow zone and occasionally hybridize. About 35 miles southeast of this location, near Cuyamaca State Park, these subspecies meet and fail to interbreed -- in other words, the two subspecies in this area are different species by the usual definition of the term [Wake1986; Wake2001]. Some striking photographs of these salamanders are available at [Brown2009]. Greenish warblers. A small bird known as the greenish warbler ranges westward from Bhutan, then north along the edge of the Tibetan Plateau into Tajikistan, Kyrgyzstan and Siberia. Along the way, these birds become slightly smaller and do not sing the same songs. On the other hand, if one follows these birds eastward from Bhutan, then north through China and Mongolia, one would find a region where the two ends of the "ring" overlap. But not only are these two groups of birds significantly different in appearance in that region, they furthermore do not interbreed, and thus, by any reasonable standard, they are different species, even though they are connected continuously around the ring. DNA analysis confirms that each local population is most similar to adjacent populations on the ring. So, if for some reason the bird were to disappear in Bhutan, for example, the populations in the two remaining sections of the "ring" would be considered different species [Rogers2011, pg. 14-15]. Killer whales. In 2010 British researchers announced that two different types of killer whales (orcas) had been identified in the waters near the U.K. Each type differs somewhat in appearance and diet -- for instance, males of one type are typically almost two meters longer than males of the other type. Genetic analysis indicates that the two types belong to different populations, and that this divergence is leading to the two types becoming different species [Bourton2010]. More recently (April 2010), another group of scientists confirmed that in fact there are three distinct populations of orcas whose DNA is sufficiently distinct that the three groups could be considered distinct species, pending further study [Wade2010]. Nicaraguan fish. In a 2010 study, researchers have found that fish in a remote crater lake in Nicaragua are rapidly splitting into separate species. In just 100 generations (over roughly 100 years), one group has developed very fat lips. 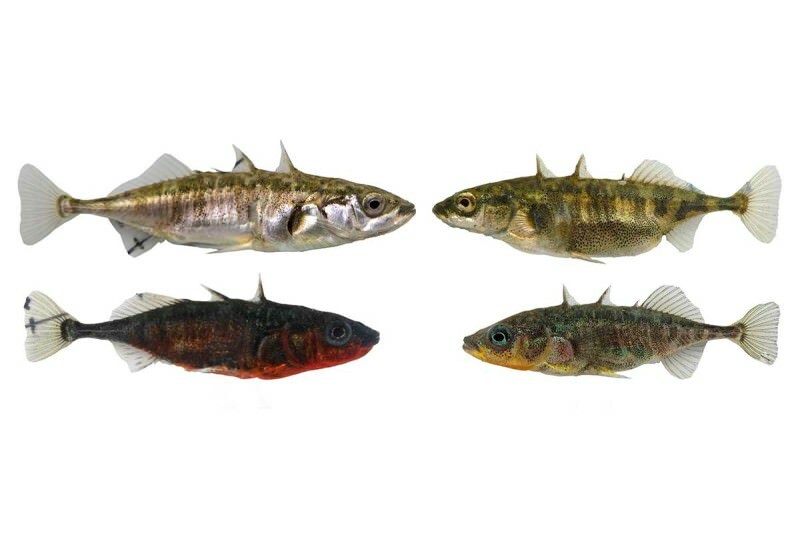 The fat-lipped fish occupy a different ecological niche from the thin-lipped variety, even though they live together in the same lake -- the fat-lipped group prefers insects, while the thin-lipped group prefers snails. 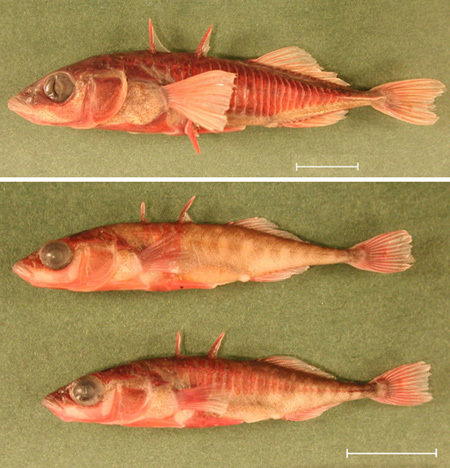 The fish do not mate with members of the other group in the wild, although lab experiments show that they still can interbreed. The fact that they do not intermix in the wild indicates that they are in the process of becoming separate species [Coghlan2010a]. Drosophila flies in Columbia. In 1971 researchers reported a speciation event that occurred in a laboratory culture of Drosophila paulistorum, sometime in the period between 1958 and 1963. In 1958 one strain, descended from a single inseminated female captured in the Llanos region of Colombia, produced fertile hybrids when crossed with specimens of different strains from the Orinocan region. But from 1963 onward, crosses attempted between the Llanos strains and the Orinocan strains produced only sterile males. In other words, the species had split sometime during the period 1958-1963 [Dobhansky1972]. Snapping shrimp. Each side of the Isthmus of Panama is home to seven species of snapping shrimp. In each case, the closest relative of a species on one side of the Isthmus is a corresponding species on the other side of the Isthmus -- a "sister species." Scientists conclude that seven ancestral species were each divided when the Isthmus arose from beneath the sea three million years ago [Coyne2009, pg. 180]. Drosophila flies in Hawaii. Similar "sister species" of Drosophila flies have been found in Hawaii. In other words, these are closely related corresponding species that are found on different islands in the Hawaiian Island chain, which evidently split in recent geologic history. In this case, the dates of the speciation events have been determined by analyzing the flies' DNA. As scientists had predicted, the oldest species have been found on the oldest islands [Coyne2009, pg. 181]. Malaria-bearing mosquitos. A 2010 study of two strains of the Anopheles gambiae mosquito, which are the principal carriers of malaria in sub-Saharan Africa, has verified that these strains have diverged so much genetically that even though they still look exactly the same, they are now, in effect, two distinct species [Nordqvist2010]. As the researchers who performed this study note, "From our new studies, we can see that mosquitoes are evolving more quickly than we thought and that unfortunately, strategies that might work against one strain of mosquito might not be effective against another. It's important to identify and monitor these hidden genetic changes in mosquitoes if we are to succeed in bringing malaria under control by targeting mosquitoes." [Neafsey2010]. Spiders in Vienna. Spiders in Vienna, Austria have evolved to build webs near streetlights. In response, some urban moths have developed an aversion to street lights [Schilthuizen2016]. Many other examples are listed in [Boxhorn2004], [Stassen1997] and in Mark Isaak's book [Isaak2007, pg. 91-93]. In short, while the splitting of two species into distinct, non-interbreeding species is normally a process taking thousands of years or more, we do see in nature numerous examples of species that are currently in that process of splitting, or indeed have split before our very eyes. Thus speciation has definitely been observed in nature.